Eugen Hehl, Arburg’s Senior Partner, has been inducted into the “Plastics Hall of Fame” by SPI: The Plastics Industry Trade Association. The ceremony took place at the gala evening on March 22, the eve of NPE 2015 opening. 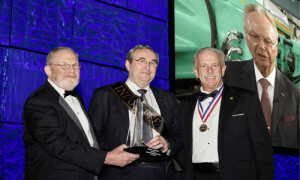 Helmut Heinson, Managing Director Sales at Arburg, accepted the award on behalf of Mr Hehl. In his laudatory speech, Jay L. Gardiner, President of the Plastics Academy, reflected on the milestones in Arburg’s success story in plastic processing. This began in 1956 with the serial production of injection molding machines with just 10 employees. Key milestones were reached e.g. in 1961 with the invention of the Allrounder principle and in 1975 with the first machine worldwide to be equipped with a micro processor controller. In 2013, the Freeformer for industrial additive manufacturing celebrated its world première. The Plastics Hall of Fame, which is located at the University of Massachusetts in Lowell, the US, has been honoring persons who have made significant contributions to the development and growth of the plastics industry since 1972.